Here are some of the Things the children may find in the box of Things. In truth, they are objects that my family and I have collected in our various travels around the world, but that’s not relevant to the workshop. What matters in the workshop is what the Things might be, where they might come from and what they might be capable of doing. 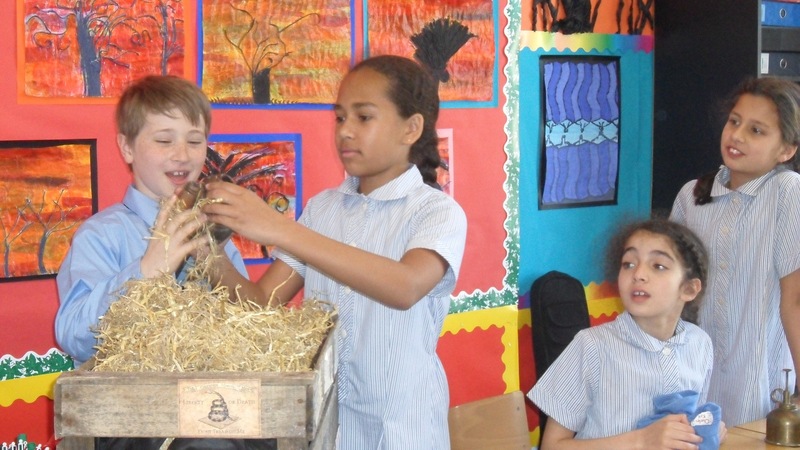 This is where young imaginations – and some great creative writing – begin to weave their magic. To give some idea of the discussions we have in the workshop, I have also given some of the questions that have been asked about each Thing, either by me or by the participants. Two halves of a broken oriental amulet. But who broke it? And why? What can they do when they are brought together? Why have a bell at the end of a pole? And what is the ringlet used for? What can you see if you ring the bell at night, then look through the ringlet? Such a strange little lidded phial… but what is that strange-smelling substance inside? What might it be used for? Who made it, and whose life has it saved? What is that pot for? And why does it contain a metal claw? Why does it make such a magical chime and who might hear it if it is sounded at midnight? I call this the Moon Spoon… but why? And what has it been used for? Who might be trying to get hold of it? An ancient urn… but what has it been used to brew? An elixir of life, or some kind of deadly poison? Who used it, and did they survive? And why does that strange old tile have a wolf’s head on the back? Or is it a wild boar? Who are these characters and what are they doing? Why have they been engraved on this strange old tile? What can it all mean? An old spray can… but who made it? And why does it spray such a strange smell? What magical power might that fragrance have if inhaled on a full moon? A mask to hide behind, or a mask of power? And whose is it? What does that lizard signify? A double-spouted teapot? Or a three-headed candlestick holder? And what does the teapot pour? Or what happens when you light the three candles?